No Admin was posting the ''Tech Card of The Week'', so I decided to take the job. Lets start out simple with Neo-Spacian Grand Mole. If the Image doesn't show up - Here you go. 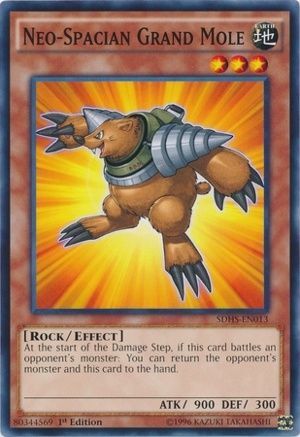 At the start of the Damage Step, if this card battles an opponent's monster: You can return the opponent's monster and this card to the hand. Couldn't this card be used with Pendulum Magicians? You know, in case someone summons Beelze or decided for whatever reason to play Melodious (*cough cough*) Doesn't target, whats gonna happen if you get Magic Cylinder'd if thats even a thing or get Mirror Force'd whatever - plus who cares if you waste 1 Normal/Pendulum Summon when you're playing Pendulum Magicians or Odd-Eyes! Thats the entire point of the deck! ...Pendulum Summon the Pendulum Monsters back in... You might've lost a BP but It was still going to happen without Grand Mole.